On a sunny, blue-sky morning with a breeze that hinted at fall, a soaring rose-hued sculpture drew curious looks Friday from early visitors to New Orleans City Park. At 22 feet tall, the “Rose Crystal Tower,” by famed glass artist Dale Chihuly, creates a whimsical and monumental marker to the entrance of the park’s New Orleans Botanical Garden. At the sculpture’s unveiling ceremony Friday, the garden’s director, Paul Soniat, said he was thrilled to have the sculpture there for two years, until November 2020. It was most recently on view in New York City’s Union Square park. Over his 50-year career, Chihuly’s fanciful glass creations have become known worldwide, and he is credited with revolutionizing the studio glass movement. His work can be found in more than 200 museum collections. Major exhibitions of his art have included “Chihuly Over Venice” (1995-1996) and “Chihuly in the Light of Jerusalem” (1999). The Chihuly Garden and Glass museum opened in Seattle in 2012. In addition to glass, Chihuly utilizes paint, charcoal, graphite, neon, ice, steel and, in the case of this sculpture, Polyvitro, a plastic material with visual properties similar to glass. At night, lights illuminate the varying hues of rose. The tower is set up high in a raised box surrounded by sweet potato vines, lemon and lime dwarf nandina, and dwarf monkey grass. The setting was conceived by Robin Tanner of Tanner Landscape Co., who also designed the Botanical Garden’s Japanese Garden and the Helis Foundation Enrique Alférez Sculpture Garden. According to Soniat, this was the second landscaping that was created around the sculpture, as the first one just didn’t look right. They wanted to create “a setting that was organic for the sculpture,” he said. Britt Cornett, director of exhibitions for the Chihuly Studios in Seattle, was at the unveiling to represent the 77-year-old artist. 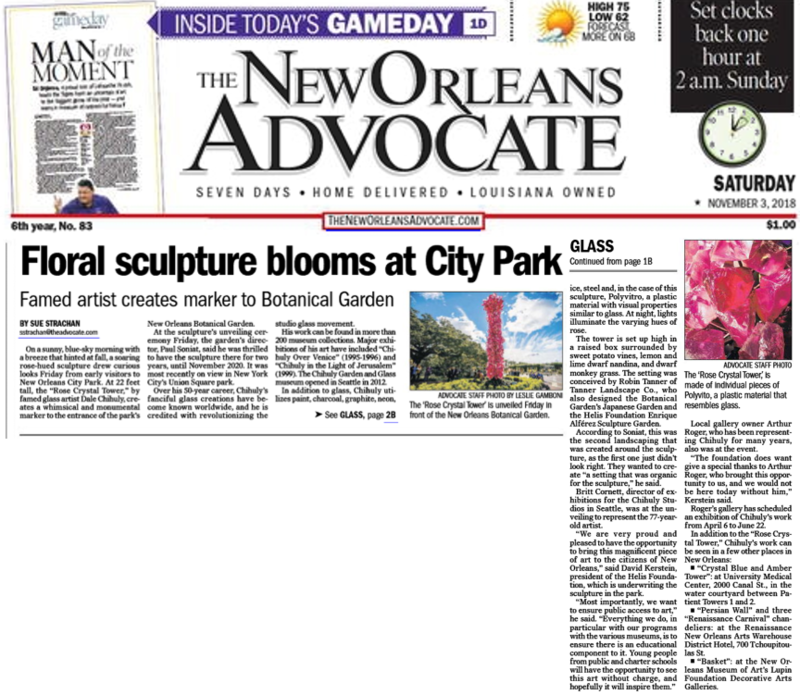 “We are very proud and pleased to have the opportunity to bring this magnificent piece of art to the citizens of New Orleans,” said David Kerstein, president of the Helis Foundation, which is underwriting the sculpture in the park. Local gallery owner Arthur Roger, who has been representing Chihuly for many years, also was at the event. “The foundation does want give a special thanks to Arthur Roger, who brought this opportunity to us, and we would not be here today without him,” Kerstein said. Roger’s gallery has scheduled an exhibition of Chihuly’s work from April 6 to June 22. “Crystal Blue and Amber Tower”: at University Medical Center, 2000 Canal St., in the water courtyard between Patient Towers 1 and 2. “Persian Wall” and three “Renaissance Carnival” chandeliers: at the Renaissance New Orleans Arts Warehouse District Hotel, 700 Tchoupitoulas St.
“Basket”: at the New Orleans Museum of Art’s Lupin Foundation Decorative Arts Galleries.